As more and more states legalize the recreational and medicinal use of marijuana every year, the subject itself becomes less taboo. Increasingly, dentists and other medical professionals find themselves in the potentially uncomfortable position of asking about a patient's personal marijuana habits, due to the potential impact it can have on oral health. Overcoming hesitation to discuss the subject is key in providing patients with vital information. In addition to causing green stains on the teeth, as reported by many dental hygienists, regular smokers can expect to see a rise in the number of caries as well as respiratory problems. Some of these dental problems can be loosely linked to the assumed relaxed state, where users might not brush and floss after smoking as they should. 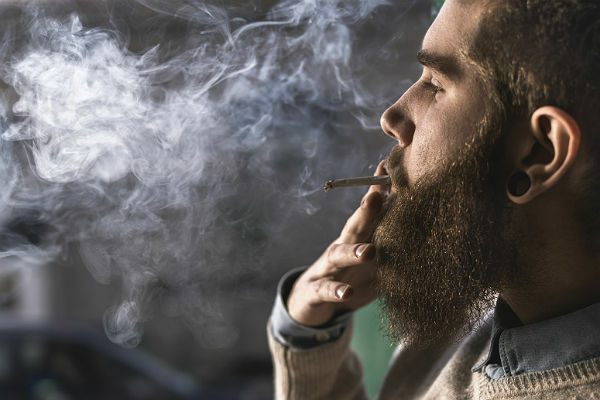 A study in New Zealand showed regular marijuana users (those who smoked marijuana at least once a week for 15 or more years) were three times more likely to have gum disease than those who didn't smoke. This can be attributed to the method of using — smoking — which increases the temperature of the mouth and causes the mucus membranes in the gums to overproduce as they try to protect these delicate tissues from damage. The high temperatures are also linked to increased chances of developing oral cancer. With prolonged usage, smoking marijuana can actually make teeth fall out because of advanced stages of periodontitis. The same effects can occur with smoking tobacco, too. However, cottonmouth — the dry sensation that occurs after smoking pot — can be connected to gum disease. The American Medical Student Association also reported marijuana users tend to get sick more often than nonusers. Clearly, something is missing from the average doctor-patient conversation about oral healthcare. While it's obvious that patients won't stop smoking marijuana just because a doctor told them so — after all, previous laws against its use didn't prevent them from partaking either — there may be some merit to sharing insight about ways of using it. In other words, make recommendations to your patients about how to use it, rather than outright telling them not to. Suggest that they get their THC fix in other ways. After all, smoking pot is one of the least effective methods of ingesting the drug. Edibles — combined with proper brushing and flossing habits — can produce a longer-lasting and more intense high for recreational users. Vaporizers also produce better results, but aren't ideal for the lungs of your patients, either. In fact, there are a variety of products that can be infused with THC, including balms, oils and more. Many ointment and solutions can be used effectively for localized oral pain, as well. THC itself can ironically even be used as an immune modulator to help control inflammation for those with periodontitis. As with most other habits, it seems that marijuana, without smoking, is best used in moderation. Speaking openly about the pros and cons of regular use with patients who appear to partake can open a dialogue for their benefit. And, if it turns out the patient really doesn't use it, at least they now have the knowledge to share with others. Carolina Pickens has a bachelor's degree in international studies and politics, and has worked as a copywriter for six years. Her experience includes years of writing website copy for dentists and doctors, as well as many hotels and hospitality venues. Carolina is also an avid nature- and animal-lover.